Swift Charters comes to the rescue with the best hourly wedding bus rental near Chicago! You know how it is when the time to say “I do” finally comes. Everything becomes hectic and the line between “magical” and “disastrous” becomes alarmingly blurry. In that case, leaving your wedding day bus charter transportation in the hands of those who can handle it, seems like the best way to go, right? When Is the Best Time to Book a Chicago Coach Rental near Me for a Wedding? You know how they say; the early bird gets the worm, so according to that logic, the early bookers get a wedding with luxury bus rental Chicago nearby. And not only for weddings, but the same goes for proms, corporate outings, and sporting events as well. But, There’s a Bunch of People Are Flying from All Over the Place! So? Swift team loves to mingle with out-of-towners! Just give us a ring, and the nearest airport transportation charter in Chicago will be there at any airport close to Chicago to pick them all up! Just say when and where are they landing, and you got yourself a deal. In that way, you’ll eliminate the possibility of any of them disrupting your plans because their estimate of the distance between ORD and wedding venue was a bit off. Chicago bus charter rental should be affordable, cozy with luggage space to spare. Also, your appointed driver is expected to be a professional who can cope with any demands you may have, no matter how long the ride is. Luckily, one of your favorite bus companies near your location a fits that description quite nicely. Why Should You Trust Us with Group Transportation on Your Wedding Day? 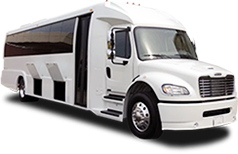 Swift Charters team is proud to be the leading bus rental company when it comes to affordable luxury and wedding bus service near my area throughout Chicago, Illinois. Operating with a different range of bus capacities, you’ll surely get a ride that agrees with your needs and expectations. Every vehicle is equipped with an up-to-date technology set and has a very luxury interior. Make sure your wedding doesn’t turn into a nightmare, reserve your Swift Charter bus on time. Protect your sweet dream!